This image of the European Automated Transfer Vehicle 4 (ATV-4) was captured on June 8 at a range of 281 km from the south of the Netherlands, three days after it was launched from Kourou on top of an Ariane 5ES rocket on its way to the ISS. 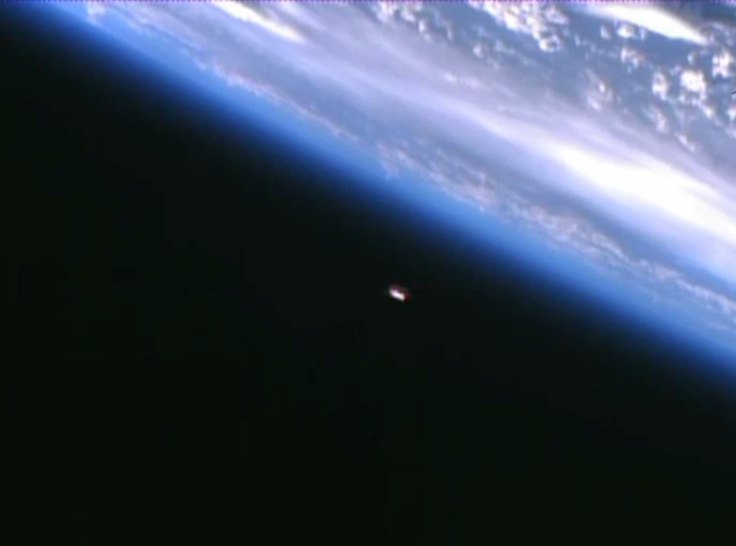 Although it was the 4th ATV, it was the 3rd image that I obtained of this type of ISS cargo vehicle. 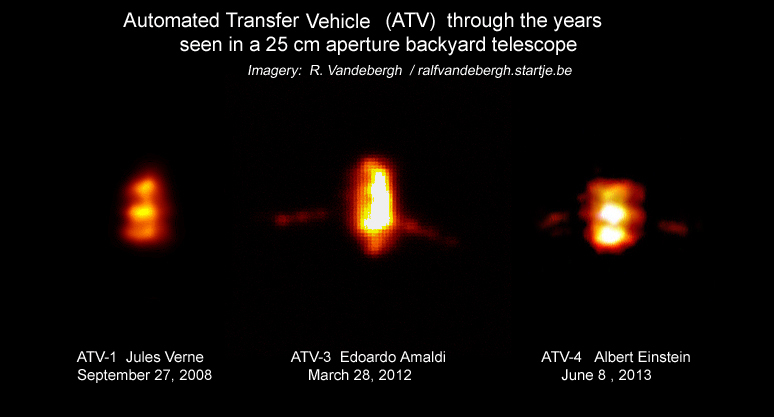 I witnessed the first passes of the very first ATV – the Jules Verne in 2008 – and since then I obtained several images of different ATVs excepting the ATV-2 which I missed due to unfavourable circumstances during the entire mission. Before 2008, my ground-based satellite imaging work basically was limited to portraits of the International Space Station. Although these improved quickly, I rarely picked up a smaller satellite as I was convinced that the best I could do was to try to take as detailed as possible images of the ISS itself. Cargo ships that appear now and then around the ISS, passing at comparable altitudes, have been a great help to learn how to photograph smaller satellites with the same setup as used for the ISS images. Because the size of the ATV, for example, is known, and you know the sizes of the ISS modules, there was very good reference for the level of detail that was obtainable in the frames of the much smaller images of the ATVs and other cargo ships. And if you know what level of detail is possible for the ATV with a certain setup, you also know the possibilities for other satellites with similar sizes and at comparable altitudes. But why was the ATV such a great help as a detail reference? This cargo freighter appears to show a good level of high contrast detail on almost every occasion. All three of the ATVs I captured with the telescope showed good resolution of detail; a number of dark ‘bands’ appear every time in the ATV images. 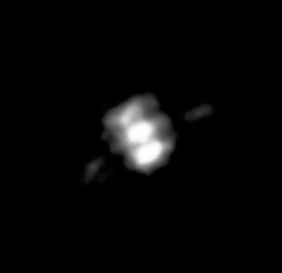 These correspond in fact with some segments of the ATV body, but it is interesting that they appear with such high contrast in the ground-based images obtained with my 10 inch aperture reflecting telescope with a secondary focus mounted video-device. Ground-based ATV-imagery in visible light – such as these images – also teaches about the difficulties of achieving visibility of narrow flat surfaces such as solar panels under different circumstances of illumination and position angle with respect to the observer/photographer. Conclusions about solar panel deployment – based on visible light images, for example – should be undertaken with some care; in many cases, the solar panels of cargo vehicles and general satellites can be perfectly deployed without showing up in the images due to an unfavourable illumination or position of the camera on the ground.